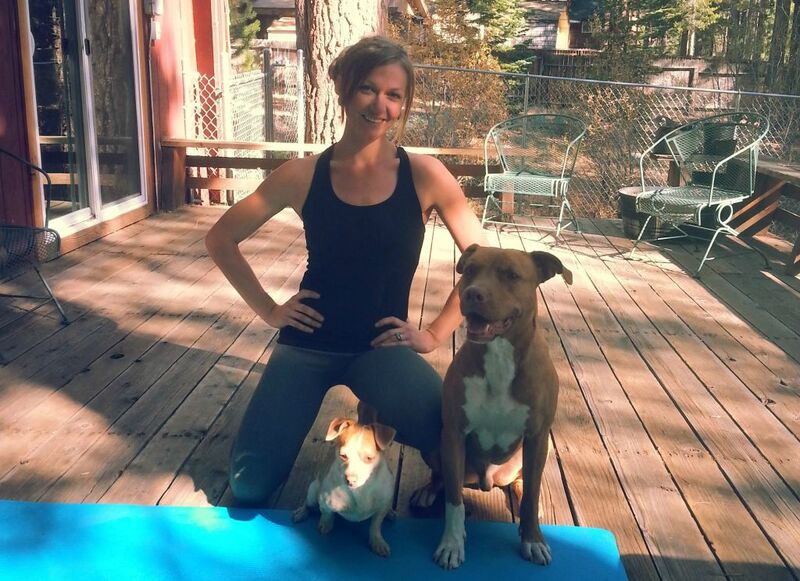 Home » Community » Crystal McGehee – Tahoe’s Self-Made Fitness Icon Bares All (Including Abs)! 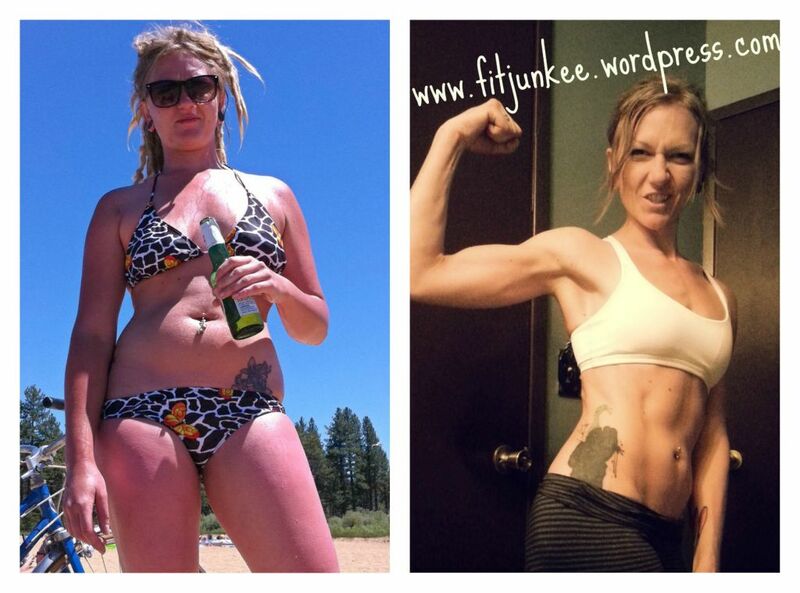 Tahoe's Fit Junkee gets candid about her personal transformation and provides a killer winter workout in photos! “Mind over matter is a very tangible practice and is extremely effective in not only supporting your goals but giving you the fresh, happy, strong, and bulletproof mindset that you will carry with you throughout all of life’s endeavors. nearly impossible to not feel a flood of inspiration wash over you while perusing Crystal McGehee’s (a.k.a. Fit Junkee) website or Facebook page. Chock full of workout photos, videos, recipes, and motivational scripture, Crystal’s online presence an invaluable resource to anyone with internet access and a desire to optimize their mindset and health! 1. 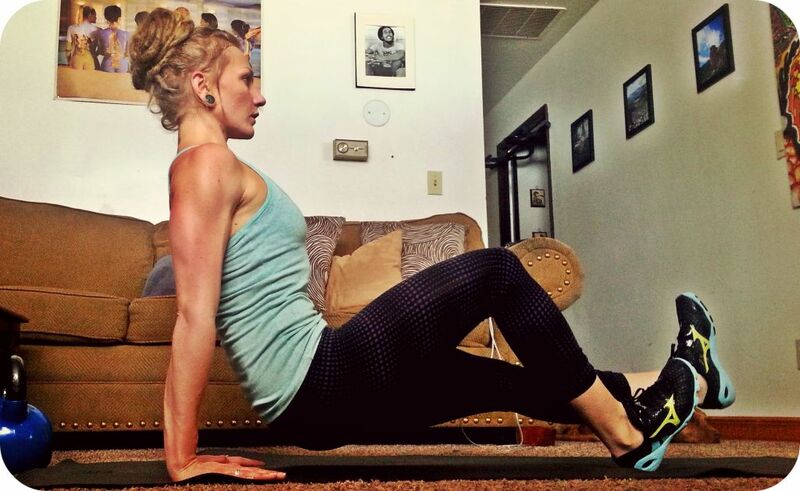 She assembles her own killer workouts! Crystal has taken what’s proven most effective for her and assembled powerful workouts that simultaneously target strength, agility, plyometrics, and, of course, burning off those pesky love handles. The best part? They can be tailored to anyone at any fitness level! 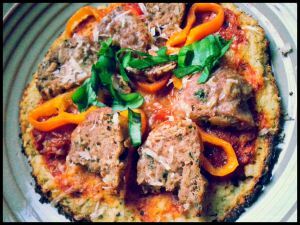 Cauliflower crust pizza!? Yes, please! 2. Her recipes are BOMB-DIGGITY! Crystal’s culinary concoctions are nothing short of mouth-watering! She’s an innovator in the kitchen: when she grew frustrated with the grocery store’s sub-par tortilla selection (they were either crusty and gross or nutritionally void) she decided to make her own! A few tweaks to an online recipe later and voila!—soft, warm quinoa tortillas with every tasty taco! 3. No need for a gym membership or expensive equipment! You live in beautiful Lake Tahoe, there’s no reason why you shouldn’t be utilizing the great outdoors in your journey to a super-you! 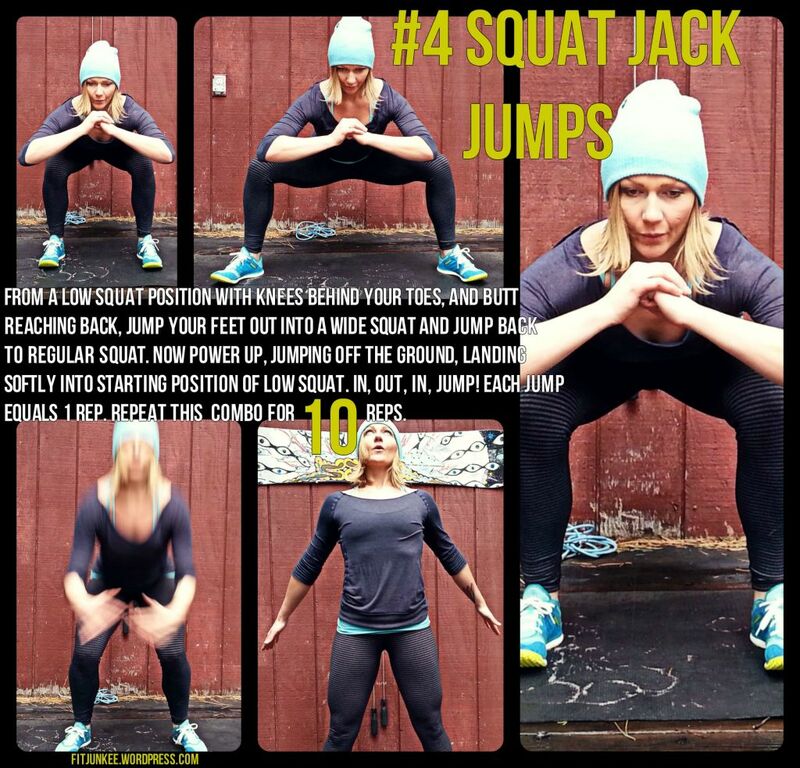 Most of the Fit Junkee workouts can be performed inside or outside. If you don’t have a dumbell in the near vicinity—no worries—grab that half-full milk jug and pump some weight! 4. There’s no agenda to promote products or a third party program. Such products or programs can be effective, but Crystal firmly believes fitness and health education should be available to everyone and anyone at no cost. She’s always coming up with creative new challenges for readers that cost nothing more than a willingness to put forth some hard work and determination! 5. You feel like she’s right there with you! Sometimes the hardest part about going through a life overhaul is feeling like you are doing it alone. Crystal’s uplifting tone and sense of humor shine through her writing in a way that is reminiscent of talking to a close friend. She’s there to remind you she’s overcome the struggle and that you can too! What we find most admirable about Crystal’s endeavor, however, is the story of triumph that stands behind it. She wasn’t always the beacon of health that stands before you today. Despite being a long time citizen in the presumably health-conscious mountain town of Tahoe, it was just a few years ago that Crystal found herself heavily immersed in the local party scene. Like many of us who often get caught up in Tahoe’s ever-burgeoning nightlife, she assumed she was doing great despite the late nights that revolved around food, drugs, and alcohol. She reached a breaking point and realized changes needed to be made —and thus, a seed was planted. Through consistency, grit, and determination, Crystal nurtured that seed into not only becoming the powerful woman she is today, but into creating a fitness enterprise committed to helping others achieve their own greatest potential! 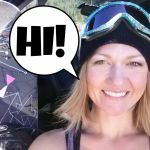 How did she do it?…..
We managed to steal Crystal away from her busy schedule for a candid chat about her journey from Tahoe party girl to Fit Junkee. Here’s what she had to say! :I think what makes you such an inspiration and relatable to others is that you’ve lived the party lifestyle many of us in the Tahoe community are all too familiar with. You’ve since managed to create a new life for yourself here. What was your life like before you decided to make a change? : I used to be a very unhappy person—although it took me a while to realize I was unhappy. My life was full of chaos. I constantly surrounded myself with social activities that consisted of working (I’ve been a bartender for 10 years), drinking, doing drugs, staying up all night, going out to eat, or sitting around for the majority of the day. I was still interested in things like hiking, snowboarding & skiing, going to the beach, disc golfing, camping, biking, and other hobbies like painting, playing music and juggling—but there was something missing. 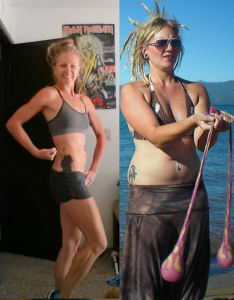 I always felt sluggish, tired, sick, out of shape, unhappy, and uncomfortable in my own skin. Every activity was an excuse to get drunk, and my life became a perpetual cycle of drinking and… well, recovering from drinking! I was in several dead-end relationships that were just as toxic and abusive, if not more, than the lifestyle I was leading. I was always searching for something or someone to distract me from the pain of my reality. :When did you decide it was time? Was there a specific event that occurred that made you realize it was time for something new? : I always knew somewhere deep within that I needed to change my habits, but I think the realization of my discomfort really hit me when I finally met my husband, Cody. He was a very athletic guy who really embodied every reason I loved living in the mountains. He liked running, river rafting, skiing, hiking, camping—the whole nine. We had everything in common. He wasn’t an alcoholic or drug addict, didn’t treat me like crap, and he made me want to be a better me. Around this time I really started to see how my decisions in life had led me to where I was then. I was fat, sick, and depressed. I wanted to take control of my life and mold myself into someone I and those I cared about could actually respect. Above all, I was tired of the negativity I surrounded myself with for so many years. It was time to change and stop making excuses. I was the only person who could do it. :What were some of the obstacles you faced in your progress? : Changing my life meant changing my daily behavior. I knew that it was going to take a drasticmove to create a new way of life for myself. I think the hardest thing to overcome was simply the fear of the unknown. I struggled with the fear of failure a lot. I struggled with forming new healthy habits and purging the old, bad ones I had practiced for so long. I realized that I had to step away from the people I had been around for years, and I lost a lot of my friends in the process. I struggled to become my own motivation and support. On a physical level, I struggled with the actual difficulty of strengthening my body to handle intense physical activity. I had to completely overhaul my eating habits and educate myself on the proper way to fuel my body to see positive results. After seeing physical changes, and feeling less stress and anxiety, my new lifestyle had really taken hold. I was hooked. I found myself constantly seeking out information regarding health and fitness, and applied everything I learned to my daily routines until I formed my very own atmosphere of healthy living. I am far from being “done” with my journey, and my struggles continue to evolve along with me. The difference is that I am a much more empowered person these days, and dealing with my struggles has become SO much easier. I can 100 percent thank my fitness and nutrition regimen for that! :You are very entrepreneurial in that you’ve created and branded your own workouts and recipes. Very impressive. Not only that, but they are accessible to anyone – no need to go to a gym, purchase shakes, or join a third party program. How/why did you decide to take this route? : When I was first embarking on my journey to health and happiness, I was doing a tremendous amount of research online. I was educating myself on nutrition and workouts every day. I found SO much information out there, and much of it was conflicting. It was overwhelming and confusing to say the least. I reached out to a lot of fitness personalities, and almost every single one of them completely ignored me. I felt very alone and slightly irritated when I couldn’t get a single one of the people I admired to respond to any of my questions! Most of the big name fitness gurus out there want you to pay to use their websites or buy some kind of shake or video tape, book, calendar, diet plan information—you name it. I didn’t have money for a gym or to invest in any programs. There had to be a better way! I kept grinding. Through trial and error I figured out what was working for me, from nutrition to workouts to changing my mindset. Then came the blog! I invested so much time creating a system that was working wonders for me, and I wanted to share that with EVERYBODY. I was seeing amazing results in my physique and mental health, and I was doing it all on my own. I decided to create a forum where other people who were struggling to change their own lives could come to ask questions, get support, and learn some valuable information—for FREE. I do not believe that fitness should be a business. I think that people everywhere should have access to the proper education regarding their health and wellbeing. We have such a problem in this country with obesity and diet related illnesses, and I believe it is mostly due to lack of education and overabundance of crap food and prescription medication. With that said, I wholeheartedly support ANY decision or action by a person to change their life and become healthy. I encourage people to find what works for them and run with it. I just don’t personally choose to buy into the industry that is surrounding health and fitness these days. :We love that you tackle important topics on your website such as cultivating willpower, finding motivation, and promoting personal growth through the fitness journey. What are some of the most important lessons you’ve learned along the way? : Throughout my ongoing story of self-improvement, I’ve learned that I alone control my life. I am the only person responsible for my health and happiness. In order to achieve a change, I must be willing to change my behavior, because waiting for somebody or something to come along and magically alter my reality is pretty silly. 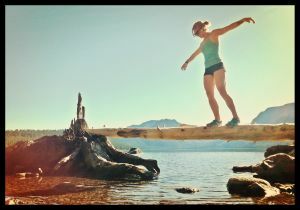 :How do you integrate beautiful Lake Tahoe and all she has to offer in your fitness routines? How has that changed your relationship with Lake Tahoe? : I have learned that our capability for greatness as human beings is exponential, and that all we have to do is change our mindset, STOP making excuses, and be willing to put in some hard work to get the things we want. I’ve learned that a healthy lifestyle is not a quick fix. It is a combination of consistency, balance, and self-control. My journey has made me an incredibly confident, happy, and successful individual. In the past, I was looking for a better life in all the wrong places, but today, I make my own life! I am in love with Tahoe. This place is literally a playground for people who like the outdoors. I take advantage of all the beautiful scenery by trail running, hiking, mountain biking, canoeing, kayaking, river rafting, swimming, disc golfing, slack lining, skiing, snowboarding, snowshoeing—the list goes on. There are enough activities to keep a person busy every single day of the year, and never see the same place twice. I have developed an amazing relationship with this place I call home on a spiritual and symbiotic level. I grew up in the foothills of the Sierra Nevada, so I’ve always had a rewarding relationship with nature. However, I’ve only recently tapped into this relationship with a positive mindset, unlocked potential, and a sincere drive to lead an active, exploratory life. :What are your goals for the future? : I am trying to cultivate a community of support for like-minded individuals—a community where people can share their journey’s struggles and successes . I hope to encourage others to make a healthy change in their life, and establish a new mindset of self-empowerment, responsibility, accountability, balance and success. I want to help educate others on nutrition, exercise, and mental health. Ultimately, I am simply trying to be the best version of myself that I can possibly be, and I enjoy sharing my story with others. 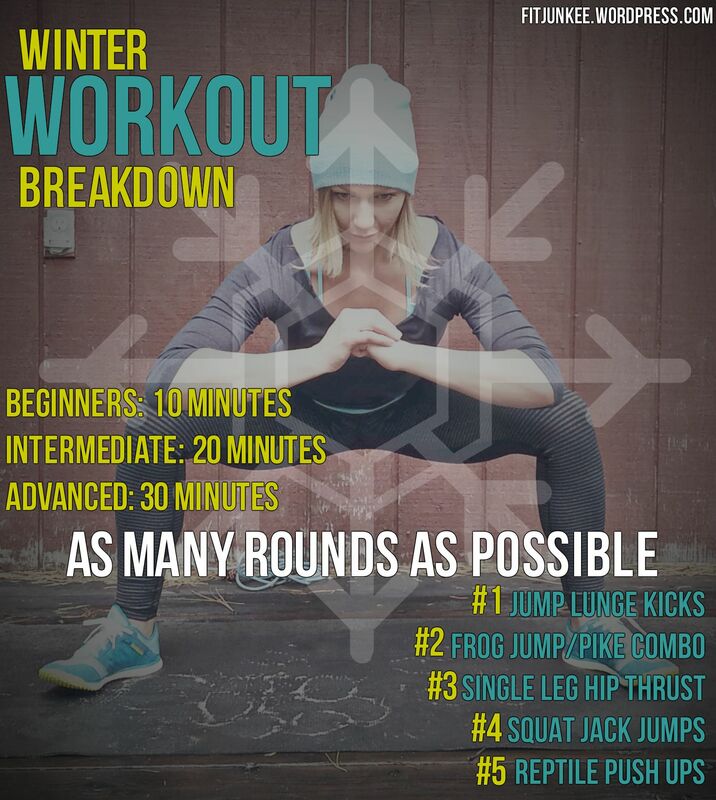 The Fit Junkee Winter Workout Breakdown! “With any journey comes struggles, set backs, and even moments of defeat. What really matters is how we approach and overcome these hurdles. Each and every one of us already has the tools necessary for success. It takes changing our thought process and taking responsibility for our own actions to unlock the potential for growth. Once we are willing to set aside our past, step out of our comfort zone, stop WISHING, and start DOING, our dreams become reality. 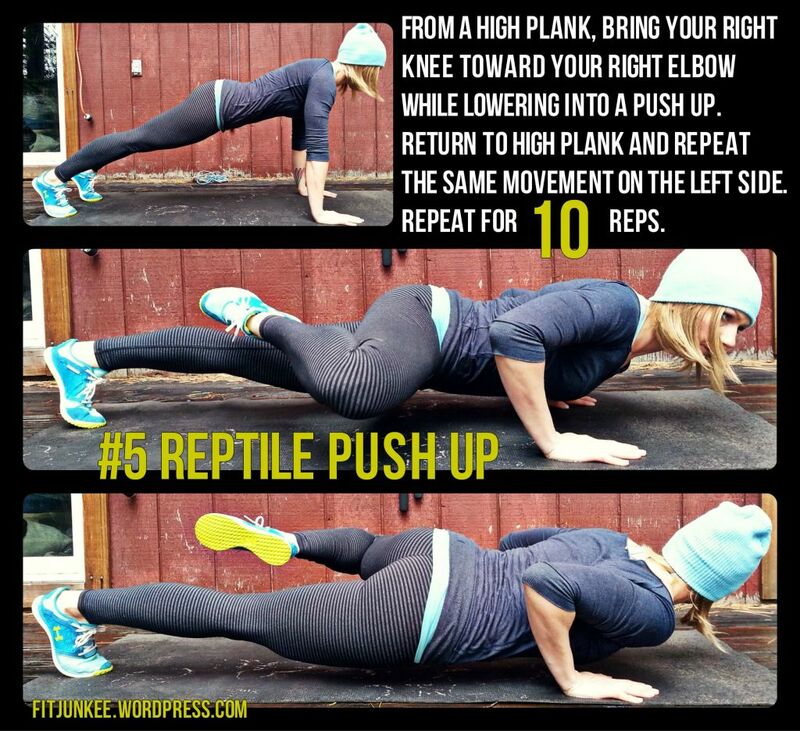 For more workouts, delicious recipes, and to load your arsenal of knowledge head on over to the Fit Junkee website! Don’t forget to follow her on Facebook as well! 5 Comments on Crystal McGehee – Tahoe’s Self-Made Fitness Icon Bares All (Including Abs)! Thank you for this amazing opportunity! I am blown away. 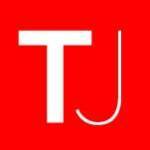 You guys are truly the amazing people doing amazing things at the Tahoe Journal. Wow, what an inspiring young lady and such profound words of wisdom! “Throughout my ongoing story of self-improvement, I’ve learned that I alone control my life. I am the only person responsible for my health and happiness. In order to achieve a change, I must be willing to change my behavior, because waiting for somebody or something to come along and magically alter my reality is pretty silly.” Truer words were never spoken! thank you. Finally!! A TRUE pioneer and not yet another person trying to shove some money sucking program like p90x or beachbody in my face! So refreshing, thank u!!! You’re shredded! 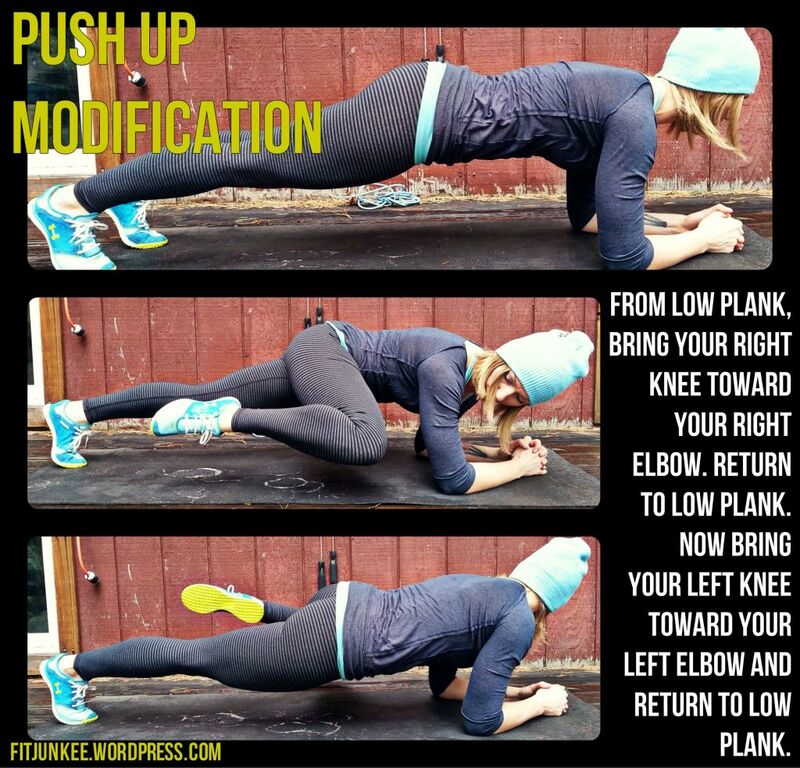 I will be doing these exercises ASAP. Thanks for the tips.